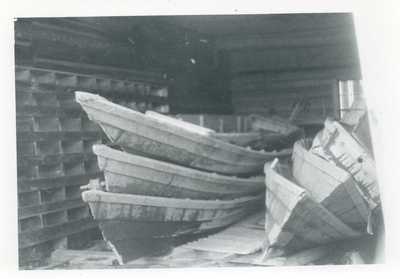 "Photograph of Supply Boats, or Bateaux "
A black and white photograph of six supply boats, bateaux, stacked and stored in a shed. Handwriting on the back of the photograph says "Churchill Stonehouse." From the Ralph J. Sawyer section of the Harris W. Soule papers. Saved near photographs dated 1938.